I hope you all had a lovely weekend! I had a terrible weekend as it involved some nasty procedures at the hospital, i haven’t ever spoken about it on the blog before but my stomach has been very poorly for a long time and i am still having investigations to find out what is wrong so i’m hoping for a diagnosis really soon, its something i might consider writing about on the blog at a later stage, if people would be interested? Let me know! Anyway,onto positive thinking i think i was in good need of some serious cheering up and what better way than to do this than some online shopping?! 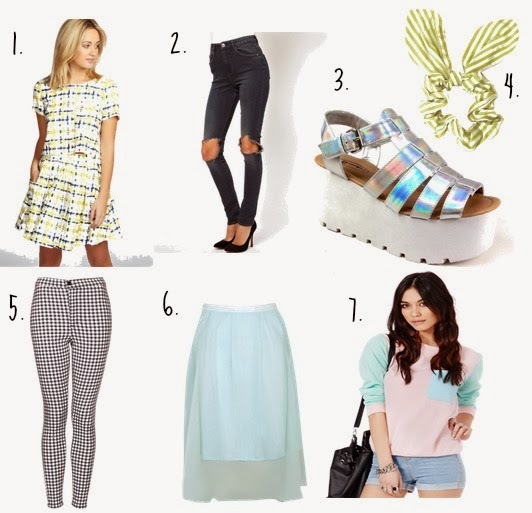 As you can see there is still a theme of pastels going on in my wishlist! 1. This co ord from boohoo is gorgeous! I would even consider just buying the top separatelty as i love the pastel yellow colour and the cut is so flattering. 2. I have wanted skinny jeans with busted knees like this for so long, they look so stylish and the colour is perfect, i always think that darker jeans are much more forgiving than light coloured ones, i am forever spilling something over my jeans! 3. WOW! Arent these the most amazing shoes ever!! They sadly dont have these in this colour on the site anymore but they have them in holographic gold which i would happily settle for, they are such a reasonable price too. River Island had a similar pair last year for almost double the price. I dont know how easy these would be to walk in though, but my feet would look amazing! 4. These bunnie scrunchies are the cutest and come in loads of different patterns, they are the perfect way to accesorize low or high ponies and will be perfect for spring,asos also do some similar ones! 5. Nearly everyone has these Joni jeans now but i just cant get them off my mind! They do look really comfy and will look so good with pastels but im not sure if this trend is to stay in the long term! 6. This pastel skirt is heaven!The mesh overlay is sooo pretty and the shape of it is really flattering, it really is such a feminine skirt. I can just imagine twirling round in this in the summer! 7. Lastly is this adorable jersey top, American Apparel almost have an identical one but obviously the Missguided version is a massive fraction of the price. It combines all my favourite pastel colours in one, what could be better! What do you think of my wishlist? Do you have any of these items? What items are you lusting after?